Baker Commentary on the Old Testament Wisdom and Psalms (BCOTWP). Baker Exegetical Commentary on the New Testament (BECNT). Expositor’s Bible Commentary (EBC) and Revised Expositor’s Bible Commentary (REBC). IVP New Testament Commentary (IVPNTC). JPS Torah Commentary Series (JPSTBC). New Century Bible Commentary (NCB). New International Commentary on the New Testament (NICNT). New International Commentary on the Old Testament (NICNT). New International Greek Testament Commentary (NIGTC). Pillar New Testament Commentary (PNTC). Tyndale New Testament Commentaries (TNTC). Tyndale Old Testament Commentary (TOTC). Zondervan Illustrated Bible Backgrounds Commentary (ZIBBC). Note the type – Many types of commentaries exist, e.g., expositional, devotional, technical, etc. Therefore, one does well to know what kind of commentary for which he or she is looking. This involves knowing basic information about the various commentary series (below). Note the series – Knowing the series of which a commentary is a part can tell you a lot about what the commentary will be like, e.g., theological persausion, quality, emphases, format, etc. Note the author – When presented with an array of commentaries, knowing something about the available authors provides one with a good place to start. Note the date – By offering some historical perspective, older commentaries possess a unique value. On the other hand, contemporary commentaries often make a practice of engaging with previously proposed interpretations. Thus, the newer commentaries carry a unique value as well. Best Commentaries – A site dedicated to providing reviews and rankings for a variety of Biblical resources including commentaries. Offers basic information about each commentary, e.g., author, date, series, and type (technical, pastoral, devotional, Jewish, special). Rolfing’s recommended commentary lists – Old Testament; New Testament. Other seminaries’ recommended commentary lists. Baker Academic’s commentary surveys – Provide a survey and analysis of top commentaries for each book of the Bible. New Testament Commentary Survey by D. A. Carson (Ref Z7772.L1 C37x 2013). Old Testament Commentary Survey by Tremper Longman III (Ref Z7772.A1 L64 2013). 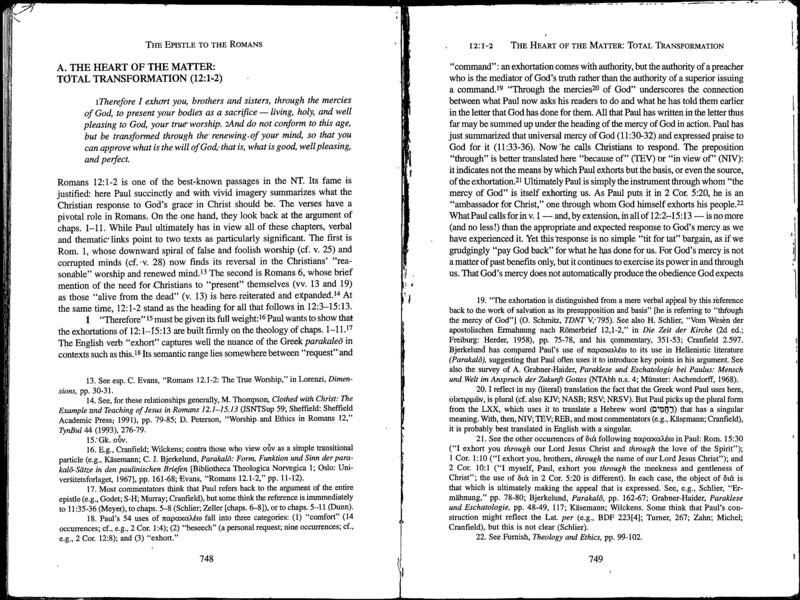 Romans by Douglas Moo in The New International Commentary on the New Testament (Grand Rapids, MI: Wm. B. Eerdmans Pub. Co., 1996), pg. 748-749. * Click on photo for larger image. This post’s information can be found within Rolfing Library’s research guides. See the guide to commentaries here.